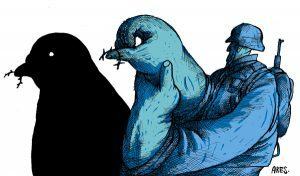 September 20, 2016 September 11, 2016 No Comments on “Finally”: Peace in Colombia? Ares. “El Proceso de Paz. Secuestrado por el Miedo?” LaPluma.net, May 24, 2014. It is with great skepticism that I reflect on the recent announcement of the peace agreement between the Fuerzas Armadas Revolucionarias de Colombia (FARC) and the Colombian government. I grew up in Bogotá, Colombia and lived through directly and indirectly the multi-layers of the most recent Colombian Civil War. 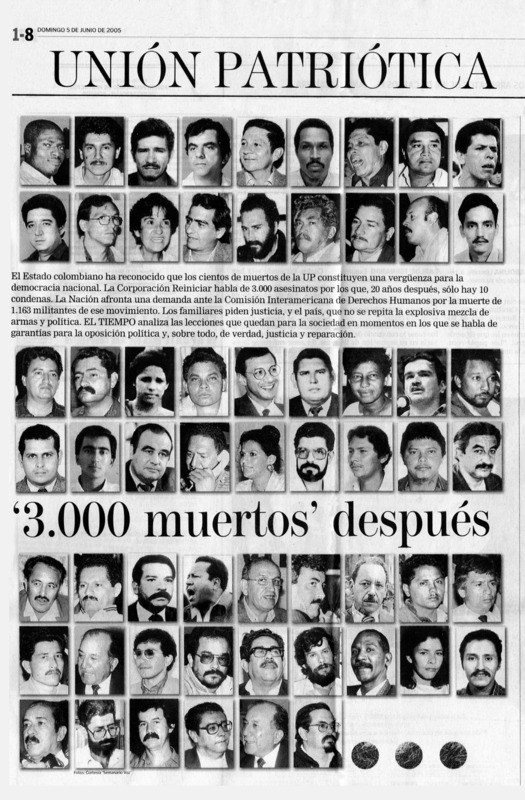 Within this fifty-two year old Civil War I experienced the other spatial dimensions of violence that also impacted and continue to impact Colombians on a daily basis. I have seen informal and organized crime, I have seen the bodies of the victims of urban social cleansing, I have been shaken by the bombs detonated by narcos, and I have heard the stories of those impacted by paramilitary violence, and even military violence. I have seen the outcomes of systemic and structural poverty that ultimately led to greater social violence, including the attacks on workers and labour union leaders, I have seen the violence that falls upon those that question the state including comedians, journalists, students, civilians and humanitarian NGOs, and I have seen the cultural violence perpetuated on women, racial minorities, the LGBTQ community, indigenous groups, the homeless and other disenfranchised groups. There is no good and evil in this conflict and from my perspective everyone has blood on their hands directly or indirectly. Some do not want peace because there is plenty of money to make from the perpetuation of war; some do not want peace because their pain from lost ones may only now be satiated with vengeance; some want peace to advance their own individualistic agendas; others want peace because they have never experienced such pleasures; and others do not even care because they are marginalized and lack citizenship rights. My experience in Colombia, my own knowledge and historical understanding as a scholar, and my gut feeling tells me there will not be peace in Colombia. 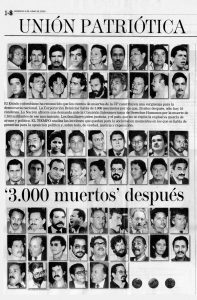 The history behind the genocide of the Unión Patriótica political party members in the late 1980s is enough evidence to show me that peace is not possible, and it is a history I am convinced will repeat itself in this particular case. My most recent conversation with my mother reminded me that peace is not possible in Colombia because there are many, like her, who do not understand or are not even close to giving peace a chance. From an Uribista point of view, guerrilla groups like FARC represent a threat to democracy and capitalist economic development. Their incorporation into civilian and political life, a key element of the peace agreement, represents an opportunity for the Left to legitimize their political agenda. A pardon, from their perspective, is impossible to conceive knowing well that they have been responsible for thousands of deaths. Their systemic violation of human rights is just not forgivable. Their complete eradication is the only solution, reminding me once again of what happened to the Unión Patriótica in the late 1980s when Para-state forces in cooperation with the Colombian military and police forces ended the lives of those who turned in their weapons and abandoned their connections with FARC and the Colombian Communist Party in exchange for a seat in the world of participatory democracy. I, on the contrary, favour the peace initiative, simply because peace is a much more efficient and stable means of building a nation, a society, and a reliable market system. Peace guarantees the formation of new generations of Colombians whose worldviews and constructs will take the nation into a completely different direction. Peace will result out of the construction of a new culture whose value systems will be based on other issues besides conflict and war. I know this because I had to leave Colombia and raise a family outside of the Colombian context in order to make sure that my son’s mental, physical, intellectual, and spiritual development was shaped by other possibilities and alternatives than the ones I saw as a child and as a teenager. I grew up in this violent conflict, it shaped my character and it has impacted my life; and I was not even in the middle of it because I was raised in the comforts of the middle class and backed by the benefits of an expat with an U.S. passport. As a “gringo” being raised in Colombia, I remember the family road trips in the 1980s worrying about guerrilla as much as military roadblocks, I also remember watching on television the live images from the M-19 Palace of Justice siege in 1985 and hearing at the family table and at the American school the discussions about the Civil War and who was victim and who was the perpetrator. I was only fifteen years old back then but my political and social constructs had already been shaped by my maternal grandmother’s worldviews. In the eternal conflict between Conservatives and Liberals, not knowing then what it meant to be a Liberal from Santander, I adopted her views in solidarity with the cousins, uncles and other distant relatives that died violently at the hands of Conservatives. I also was consumed by the “Robin Hood” stories of outlaws such as Efraín González and others who fought against the Colombian military forces and their elite-driven policies. The same year of the siege, as my mother took a shortcut through one of the neighborhoods in the north of Bogotá to give me a ride to school because I had missed the bus, I saw three men violently dragging a man out of his house while a fourth and fifth forcefully controlled the man’s wife and two children. The image is still stuck in my head; I am still convinced that it was secret police behind the kidnapping because, according to my mother, they drove off in official government vehicles. In 1989 I saw the mushroom cloud and felt, as I was driving up the Circunvalar Avenue, the impact of the explosion of Pablo Escobar’s bomb on the installations of the Departamento Administrativo de Seguridad (DAS) and a few years later I was stuck for two hours on a highway going from Villavicencio to San Martín as the military and guerrillas exchanged cross-fire over civilians stranded on the road. My senior year, after a long night of partying, I was awaken by a phone call from the people that I had been out with a few hours before to tell me that one of my classmates had been kidnapped, shot seven times, and thrown into a sewer system. He survived, we still do not know how, but that night reminded me that Colombia was a violent place. A few years later, returning to Bogotá after my sophomore year at Clark University, I was once again reminded that peace is hard to come by in Colombia after a massive soccer brawl between rivals erupted right outside the stadium; police against civilians, civilians against civilians and civilians against the police authorities, while the homeless and the petty thieves pick-pocketed the wounded that were lying on the streets. In a culture of violence there is no space for peace. If Colombia’s collective goal is peace then a culture of peace must evolve over time and not just through the signing of a peace agreement. The fragility and lack of credibility of Colombia’s democracy, the lack effective institutional structures to enforce the protection of human rights, the lack of state accountability, state-driven corruption, the interdependence between narco money and national economic development, the pressures of neoliberalism and globalization, the increasing presence and control of foreign interests over the national resources, and the incremental gap between rich and poor at a time when the national economy has reached record breaking growth lead me to conclude that peace is not achievable. In late August, as the peace negotiations inundated global media, thousands of disenfranchised Afro-Colombians took the streets in the Chocó region, one of the most impoverished regions of the country, demanding the institutional presence of the state and the protection of human dignity. Can peace be achieved in a country that marginalizes minorities? Can peace be reached if there are still other guerrilla groups that are yet to sit down to negotiate? Can peace become a reality in a country where paramilitary forces, narco-trafficking cartels, and multiple organized and unorganized criminal organizations live their daily lives next to a class-divided society, and an increasingly corrupt political class? Can peace implemented in a nation where multinational corporations, such as the Canadian mining companies, use paramilitary forces and other indirect methods of violence in order to protect their interests from communities and labor unions that are fighting for their own rights in the absence of a state that defends the interests of foreigners over the interests and wellbeing of its own citizens? I do not think so. From my perspective the recent peace agreement that was engineered by President Juan Manual Santos and FARC higher ups only serves as good public relations and marketing. In a globalized economy and under the current neoliberal model of economic development what the Santos administration was looking for was a peace agreement that could then be used as bait in order to attract greater foreign investment, ultimately increasing the nation’s dependency on the international system. Colombia is a nation of appearances and this peace agreement provides the private and public sectors with proof that Colombia is a stable democracy open for business. The FARC members that will be reinserted into civil society will suffer the same fate as their brothers from the Unión Patriótica. Colombia’s history has shown us that the disenfranchised sectors of society are resilient and that new leadership and civilian movements will pick up the struggle where the other groups left off. The historic cycles of short periods of peace and long periods of violence will continue to shape the nation, its society, and its political economy. It is possible that this peace accord represents a short period of relative peace, but even when there were moments of peace as during the times of the bipartisan agreement known as the Frente Nacional (1958-1974), other forms of civilian violence remained intact under the vigilant eye of the state. Colombia’s model of democracy that is based on selective violence will continue to remain in place with the approval of the United States and the rest of the international community. Peace will only be achieved through cultural transformation and this will only take place when the power structures, foreign and domestic, agree on the redistribution of the nation’s wealth and when political accountability is finally incorporated and implemented judiciously within the structures of the state at the local, regional, and federal levels. Stefano Tijerina is a multidisciplinary scholar currently teaching at the University of Maine. He is also the director of the Peace and Justice Center of Eastern Maine. His research focuses on the transnational dynamics of globalization, international political economy and international business and the expansion of capitalism across the Western Hemisphere. His book, Filling the Gaps in the Americas: Canada and Colombia, 1767-1968, is forthcoming in 2017.